MY HUSBAND IS A HARDWORKING automotive machinist, on his feet all day resurfacing heads, turning brake rotors, rebuilding engines and more. His work is always in demand because so few do what he does and he’s good at what he does. Really good. 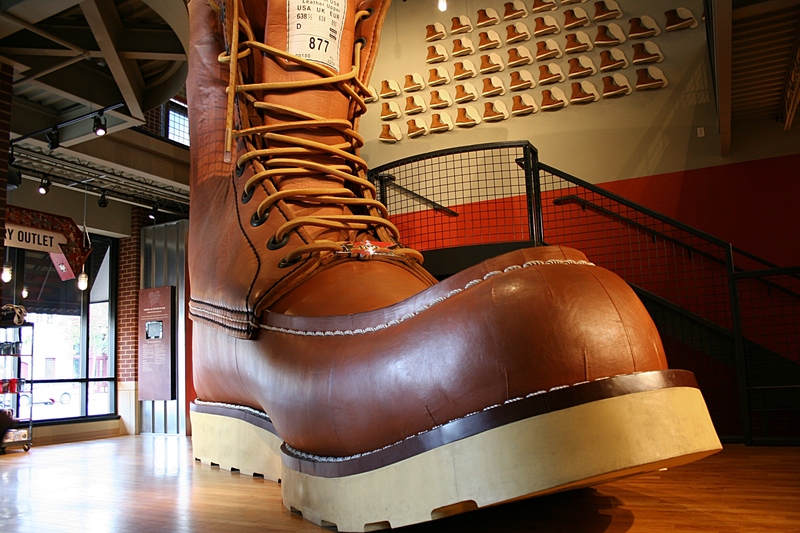 Step inside the Red Wing Shoe Store in downtown Red Wing and this gigantic 20-foot long by 16-foot high, 2,300 pound replica Red Wing work boot grabs your attention. It’s in the 2005 Guinness Book of World Records. He needs sturdy work boots that offer comfort and support and protection from grease, oil and dirt. Sometimes he’s worn Red Wing boots, sometimes boots from Mason Shoes across the border in Wisconsin. 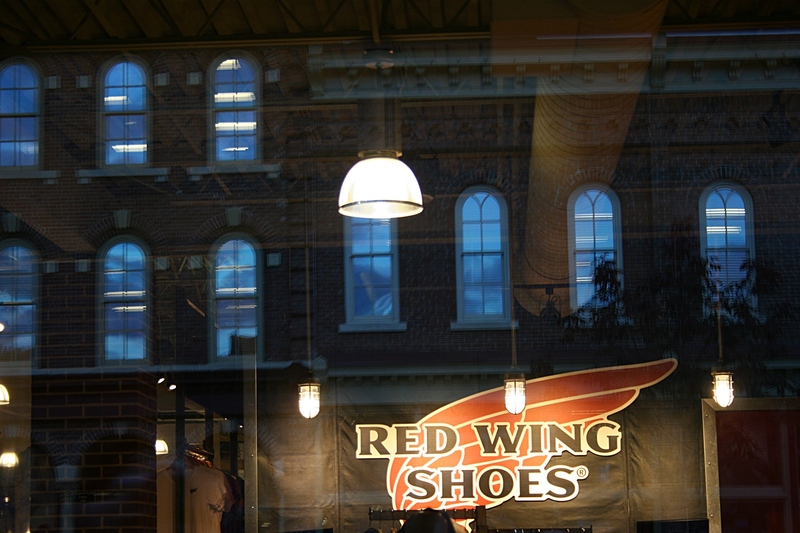 Darkness descends outside the Red Wing Shoe Store. 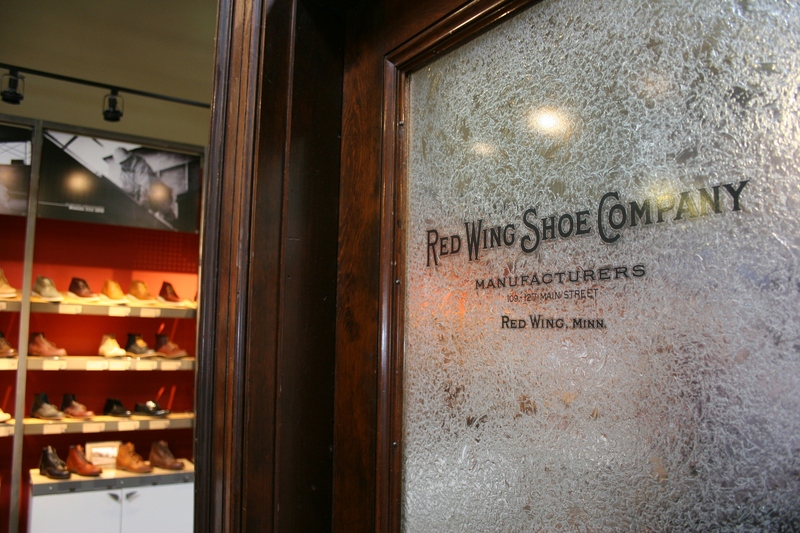 On a 2014 visit to Red Wing, the Red Wing Shoe Store and its on-site second floor museum were on our must-stop list. Randy was having problems with a pair of Red Wing boots not fitting properly. He’d tried to get the issue resolved at our local Red Wing shoe provider. But still, the problem persisted. Go straight to the source, he decided. 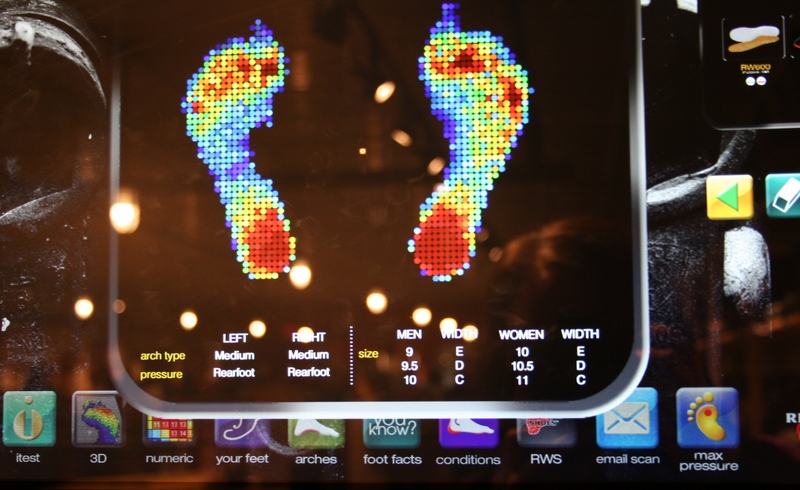 Randy stepped onto a machine which determined pressure points on his feet and projected the results onto a screen. The search began for the right boots. Randy received great one-on-one attentive customer service. That was the right decision. 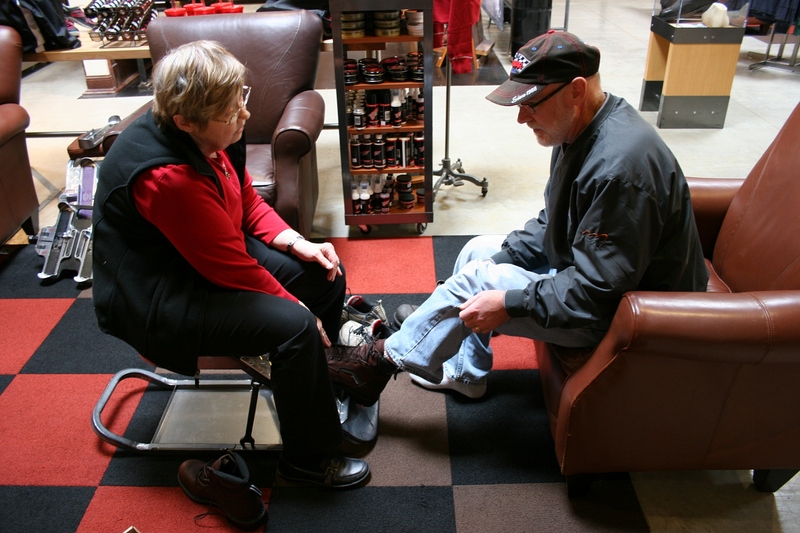 While Randy’s feet were measured and checked for pressure points and he tried on numerous boots, I meandered. Through the outlet store, through the museum. Eventually Randy found boots and the old ones were determined defective, just as he thought all along. We spent a lot of time at the store, but left satisfied customers. The iconic Red Wing Shoes logo. Since 1905, when Red Wing Shoes was founded in this Mississippi River town in eastern Minnesota, this shoe company has been crafting shoes for hardworking people like my husband. Footwear in the company’s Heritage Collection is made just as it was originally, handcrafted from premium leather. 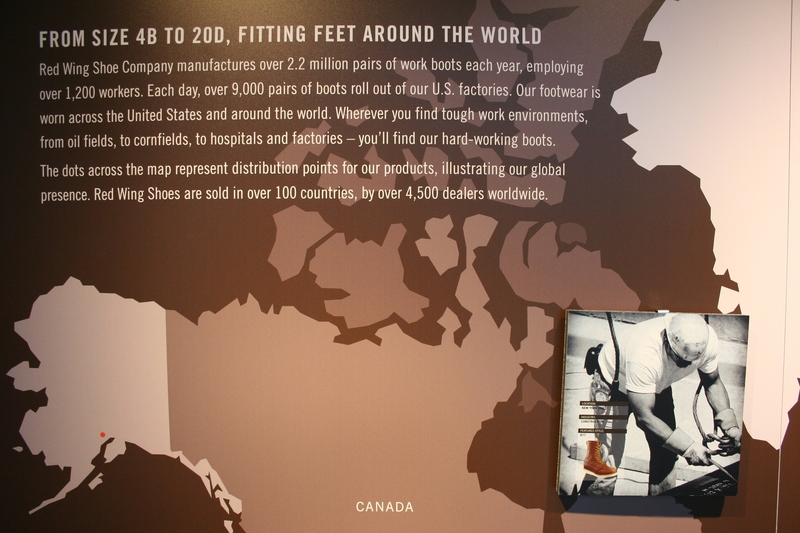 A museum map shows Red Wing’s global market. But, I discovered, not all Red Wing shoes are made in Minnesota. Those new boots Randy got, well, they are made in China, says so on the label inside the tongue. 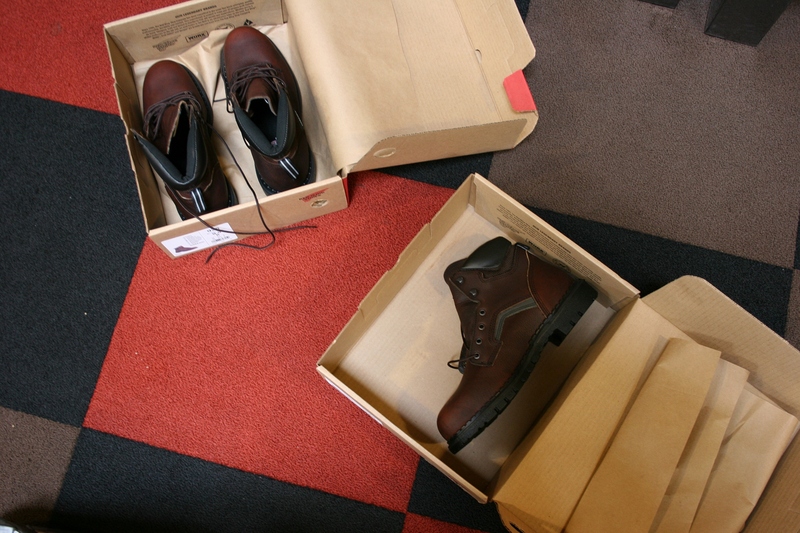 To be honest, we both felt a bit betrayed, thinking he’d gotten American-made boots. I suppose we shouldn’t be surprised. 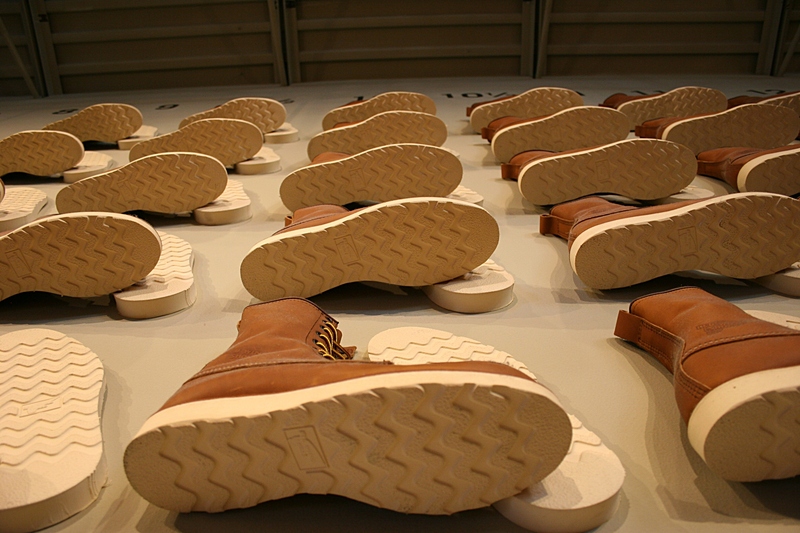 Rows of boots line a wall leading to the second floor museum. Even given that discovery, my husband remains loyal to the Red Wing brand. He likes his new boots, which I convinced him not to wear to work. He looks really good in his 435 Men’s 6-inch boots. They’re much sexier than sloppy tennis shoes. That left him without work boots. So he ordered a pair from across the border. 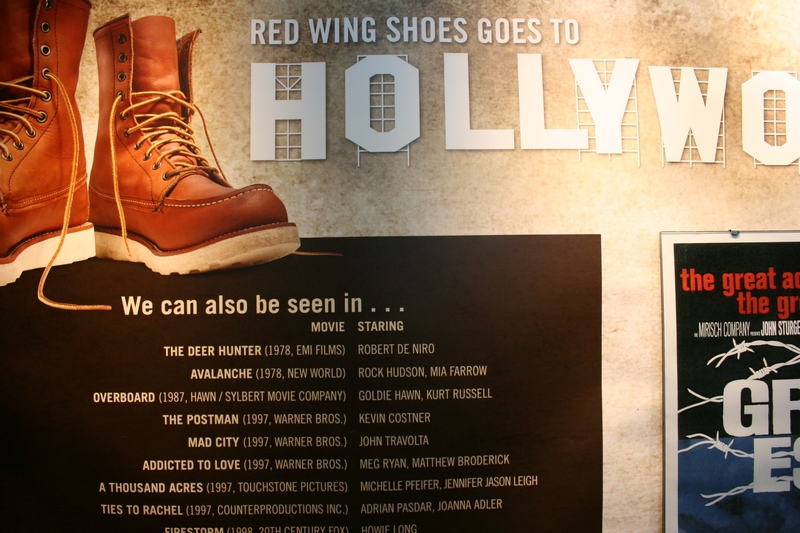 Even Hollywood chooses Red Wing shoes, according to this info in the museum. Yeah, I know what you’re thinking. So much for customer loyalty. His new boots from Wisconsin aren’t fitting all that well. Maybe he should have gone Red Wing again, stuck to the iconic workhorse boots which sometimes, and sometimes not, are made in a Minnesota river town. 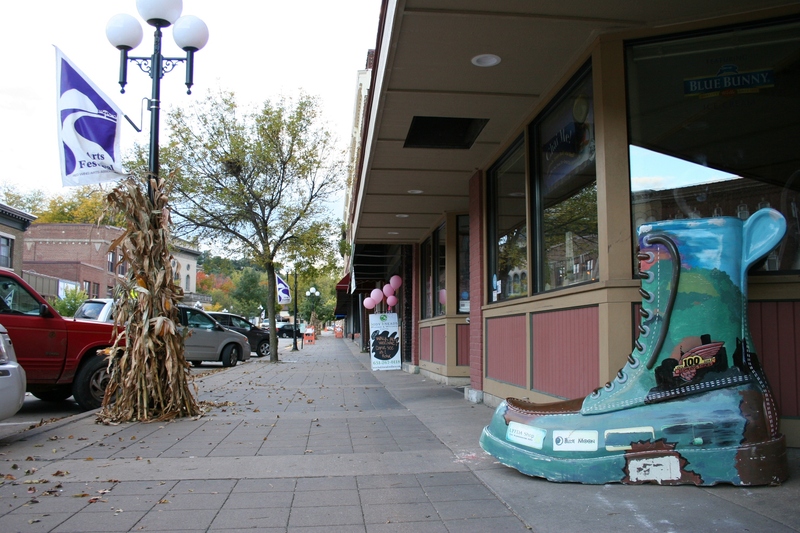 Red Wing boot sculptures can be seen in downtown Red Wing. 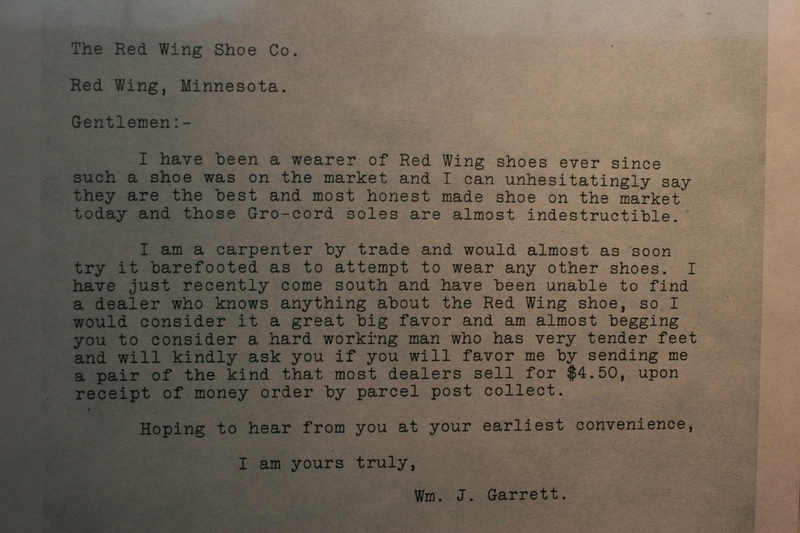 A letter is posted in the museum from a long ago customer attesting to the quality of the shoes. I slipped into a Red Wing boot in the kids’ dress-up section of the museum. 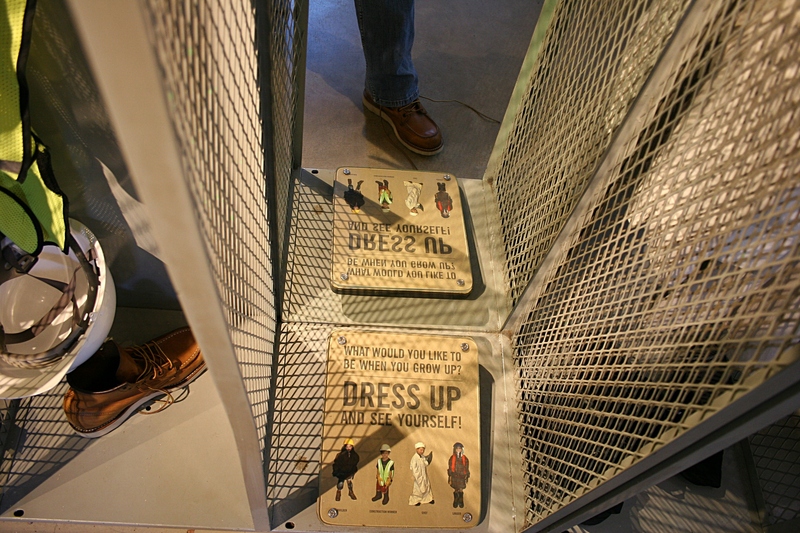 Kids are encouraged to try on an outfit and Red Wing shoes. 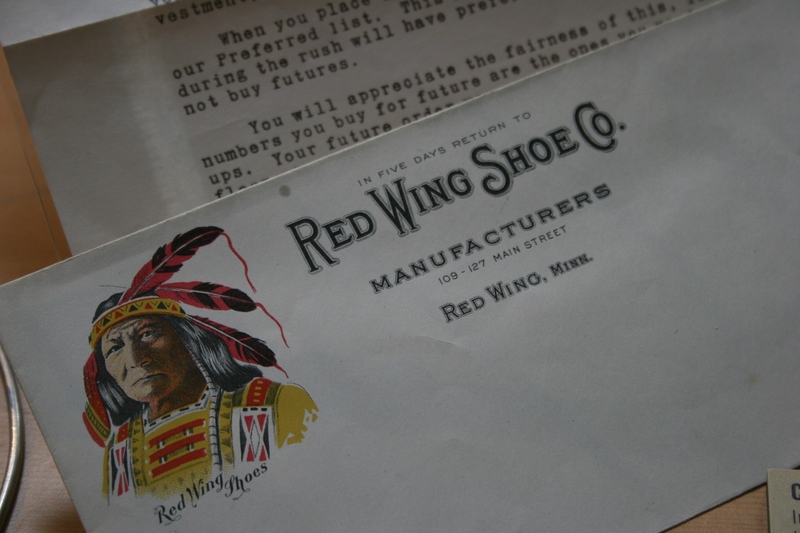 In 1912, The Red Wing Shoe Company began using the “Chief” logo to promote a new line of “Chief” products. Inspiration for the “Chief” graphic came from an employee’s childhood photo collection. The logo was used until 1928, when it was replaced with the red wing logo design. 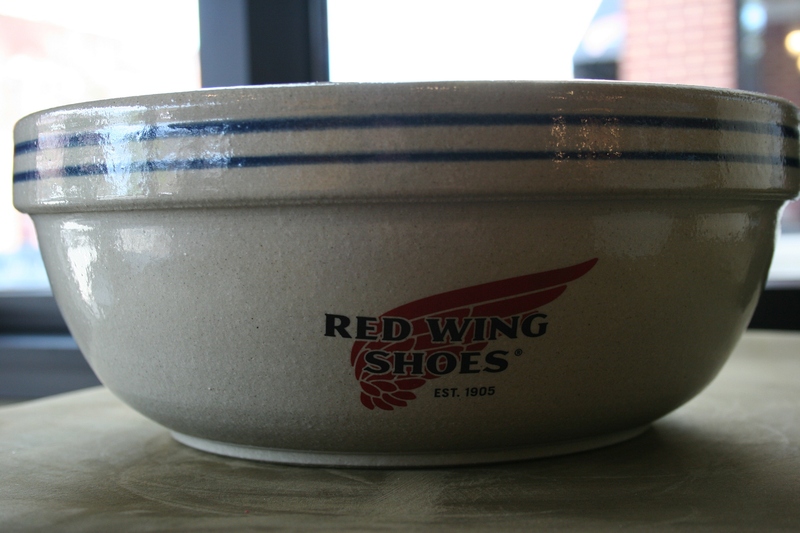 In the gift shop, I spotted this beautiful Red Wing Pottery bowl. A lovely old door in the shoe store. FYI: Click here to read the first in my series of stories from Red Wing.